Today’s leg of the A2B Journey marks a couple of interesting milestones. First, I finally left Buck & Doe Road and turned onto the “Main Street of America,” also known as Route 66. The A2B Route will follow Route 66 for the next 45 -50 miles. The other milestone is finally reaching Peach Springs, AZ, the first town of any significant population in quite some time on the A2B Journey. It is also the first landmark on this stretch of the famous highway. In 1866, the U.S. government granted the Atlantic and Pacific Railroad (later known as the Atchison, Topeka & Santa Fe) a right-of-way to build a transcontinental railroad. The construction of the railroad through northern Arizona was completed in 1883. With its abundant water supply, Peach Springs became a “division point” for the railroad. The town sprouted along the railroad tracks. A post office was established in 1887. 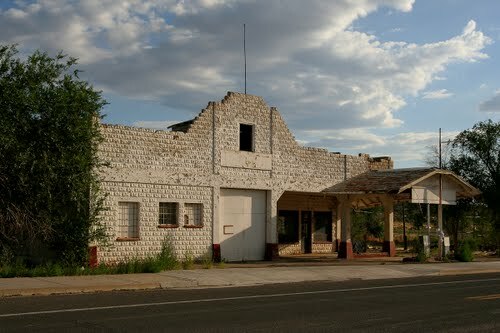 The ease of access to the Grand Canyon via Peach Springs led to the construction of a “Harvey House” restaurant and hotel for tourists. This period of prosperity lasted for about two decades. Later, the railroad moved its division point to another town. Peach Springs quickly fell into decline afterwards. 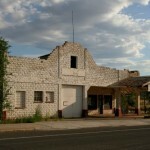 However, the town’s economy was later boosted for a time by traffic from Route 66. I woke up this morning extremely eager to run. So eager that stretching seemed nothing less than a chore! Thankfully, experience reminds me that whatever I aim to achieve on any given run will be easier (and better) with a proper stretch. I wanted a long run today. My mind was awake and fully occupied. I needed time and solitude to think. I chose to run on an extended greenway where I would not be distracted with intersections and traffic. Within the first few hundred yards, I settled into a quick and energetic pace. According to my stopwatch, I seem to have kept a steady cadence throughout the run. Today was one of those days where I was so buried in my thoughts that I honestly cannot recall very much at all about the run. I do not know if any of the hills on the route were particularly challenging because I really do not remember running them. Not sure about the weather either, if it rained or was too hot. I know that my water bottle was empty at the end of the run, so I must have stayed hydrated. To put this section of today’s post into context, it must be noted that I love music. I am passionate about it. I am an aspiring musician. My greatest desire is to write, compose, and arrange music that will out-live me. My thoughts while running were completely dominated by a dream that I had last night. As mentioned in previous posts, I often have vibrant, full sensory dreams. (Full sensory means I experience all 5+ senses in my dreams.) It is not unusual for the sensations experienced during a dream to linger after waking. Occasionally however, a dream will impact me so profoundly that it is difficult to focus on or feel anything else for a long, long while afterwards. Such is the case today. My dream started with a cinematic panorama of an open country side in the late afternoon, just before dusk. In the distance, I saw myself walking along a path with a couple of other people that I did not recognize, but were obviously friends. As I watched us move down a path, I heard a piano playing. I immediately recognized the song! It was music that I had written. It was simple at first. Then it began to fill out. The melody was a fun tune! The kind that sticks with you. I remember thinking that it was kind of Lennon-McCartney-esque. The piano music became much more robust and full while the colors of the sunset gave way to night. Stars quietly made their entrances. The music made the scene more beautiful. The scene made the music more pleasing. An artistic synergy that I love. The music kept building. It seemed to be driving us forward, leading us somewhere. It was around this point when I moved from a third person observer to a first person participant in my dream. My friends and I began to approach what appeared to be a very large cottage. It looked warm and welcoming. On our way there, my eye caught sight of interesting looking stick on on the ground. Without thinking, I reached down to pick it up. As we neared the cottage, I heard another piano join in the song. The music was rich and bright! I wanted to pause and just enjoy it! But somehow I knew that I had to get inside the cottage. I was starting to feel a little anxious and hurried. Just as I entered front door, the music slowed and softened. It went back to one piano, It became more rhythmic than musical. I noticed that my friends had disappeared down a hallway. I was alone. Just inside the door, there was a very long and narrow stair case rising in front of me. I suddenly realized that this was more than a cottage. It was much bigger! I began climbing the stairs. I could feel my heart beating with anticipation. I heard a violin softly begin to play and hold a single note behind the piano. Then there were two violins playing the same note. And then another. And another. Soon, a cello. Followed by a series of other string instruments. All playing and holding the same note. As I continued upward, other instruments entered. Oboes, bassoons, flutes, clarinets, etc. Then came the brass instruments. It became a slow unison crescendo of volume and texture with each new voice. The intensity of the piano rhythm rose evenly with the growing symphony. All holding and building that single note. A little more than halfway up the stairs, I noticed the stick in my hand was unusually straight. It was then that I heard French horns break away from the unison. They began climbing chords, note by note. Slow half notes at first. Followed by quarter notes. Then rushing eighth notes that bled into triplet eighths. Finally, a rapid barrage of sixteenth notes. The rush of notes made my heart beat faster. I sprinted up the remaining stairs to a podium at the top. Just as I reached the apex, I lifted my hands and the stick (now baton) high in the air just in time to drop them onto a thunderous 1 count. The symphony (now before me) absolutely erupted into a brilliant, violent frenzy of music and percussion. An orchestral explosion, of sorts! Melodies and countless counter-melodies. Tight harmonies and occasional dissonance. It was crazy! Intense! Beautiful! Spirit-lifting! What an amazing moment! Musicians and audience were fully absorbed. For a few minutes, nothing mattered. I remember looking up to see that I was in an auditorium with lots of windows. The night sky was visible all around. It had a “nature’s cathedral” feel. The auditorium was full. Most of the folks there were people I did not know. But I did see a handful of family and friends. I was so excited to be able to share this music with them. As the climax of the music subsided, the 1st Chair Violinist came to the podium to conduct the orchestra while I went to a piano on the stage where I finished the song with the orchestra. I was flooded with a feeling of gratitude to finally be able to express and share a part of something that I had quietly carried inside for all of my life. I looked for my family and loved ones. When I found them again, I ran to them. Unable to speak, I just held them. Throughout the entire run, I replayed the dream over and over again in exquisite detail. I wanted to etch it deeply in my heart and mind. I never want it to fade as dreams often do. I told myself over and over again, “Please me to make it real! Do you have a life desire or passion that drives you? We’d love to hear about it and cheer you on!